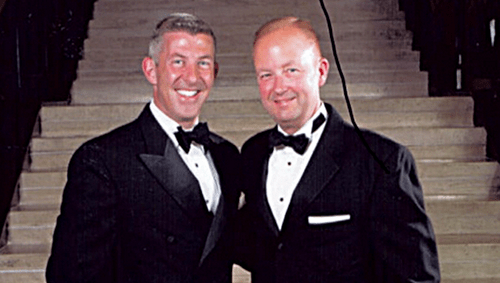 Anthony J. Fera , president of the Houston-based oil company MidStar Energy attacked longtime business leader in the Dallas LGBT community Andy Smith (pictured above right) the executive director of the Texas Instruments Foundation on April 19th. in a downtown Austin, TX parking lot. Smith yelled at Fera who responded with anti-gay slurs, the affidavit says. Fera and Smith continued to argue until Fera eventually got [out of] his truck and punched Smith in the face, according to the affidavit. Smith was unconscious for about a minute and suffered a broken nose as well as cuts to his face, the affidavit said. Fera, 51, is the president of MidStar Energy and the father of former UT kicker Anthony Fera. MidStar Energy’s website lists horizontal drilling and well planning among the services it offers. Fera was finally arrested on June 2nd. and charged with assault with injury, a class-A misdemeanor punishable by up to one year in jail and a $4,000 fine. Texas has a hate crimes law that includes sexual orientation. However, there is no penalty enhancement available under the hate crimes law for a class-A misdemeanor. Fera is rich, white, and oil guy and its Texas. Its highly unlikely that he will face any serious repercussions.